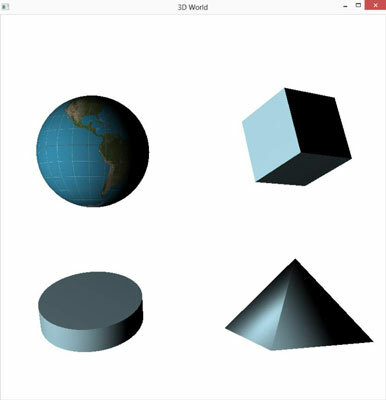 Creating a virtual 3D world is easier than ever in JavaFX. In this example, you learn to add a sphere to your JavaFX program, animate it, and add a light source to it. This figure shows the resulting sphere. 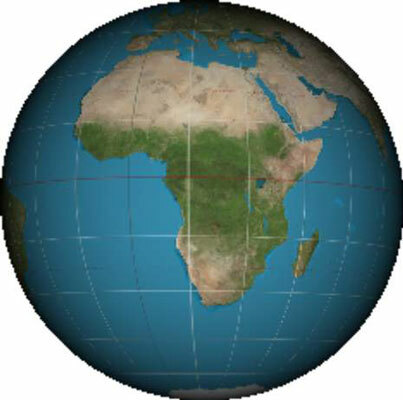 A sphere with a cylindrical projection of the earth applied as the Phong material. Whew! Your 3D virtual world now has an object: a sphere that looks like the earth. You can also add other objects at this time. After the play method is called, the sphere starts spinning, making one complete turn around its z-axis every three seconds. The sphere rotates around the y-axis, creating the impression that the world is revolving. For the sphere, the speed is set to one revolution every 10 seconds. The last step into this foray into the world of 3D programming is to add a light source. The light source will change the whole look of the scene, as shown here. Your 3D world with a light source. The PointLight class defines a light source that originates from a specific point in the scene and projects light of the given color (in this case, good old white). To create the lighting effect, relocate the light by translating its coordinates 1,000 to the left, 100 down, and 1,000 units toward the user. The result casts nice shadows on the backsides of the spinning objects.